← The Selimiye Mosque in Edirne. Masterpiece of Ottoman architecture. The Maritsa River is the border between Greece and Turkey except in one place, the old station of Edirne in the picturesque neighborhood Karaağaç. It is the only territory of Turkey west of the Maritsa and a place we should not miss when we go to Edirne. To complete the appeal of this quiet university area, access from Edirne is across the bridge with Meriç Selimiye Mosque the bottom. At other times, Edirne was the gateway to Turkey. The ancient capital city of the empire and pampered by the Ottoman sultans, had been elected in 1868 as a crossing of the railway line from Istanbul to Vienna. Nowadays, air travel have been students Istanbul, globetrotters and travelers of all kinds who previously received their first impression in Edirne Turkey. The station building is one example of railway architecture in the late nineteenth century. When building a new station in the city caused the cessation of its activity, the building and its surroundings were placed under Trakya University. Initially, there the rectory and offices were later to become Faculty of Fine Arts. You can not imagine a better place to teach these lessons. In memory of its former use, after the building of the old station located a vintage train is kept in a tranquil garden. 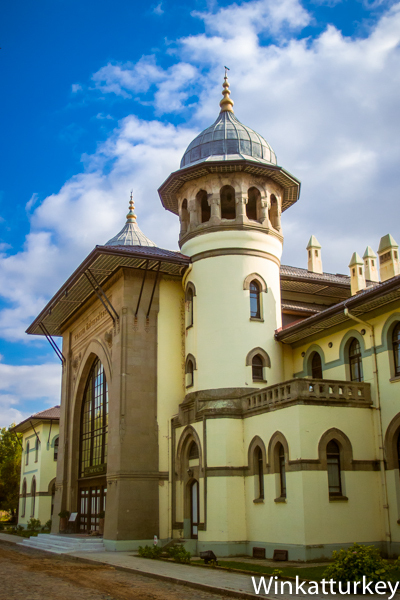 The walk through the station also allows us to see some old Ottoman mansion in perfect condition. Throughout the neighborhood there are some mansions Karaağaç more. It is a neighborhood that separation from the city due to river, more like a small town. It is a quiet and friendly area university cafés and restaurants. To go to the old station's exit Edirne southwest across the river by the bridge Meriç. On the banks of the river there are many places to get a coffee or lunch in a nice atmosphere. Do not forget to contemplate the view of the city from the west end of the bridge, with river in the foreground and the Selimiye Mosque dominating the skyline.